CURTIS, Neb. _ Thirteen Aggie livestock judging team students and their coach cruised nearly 1,000 miles for two collegiate contests in Nebraska and Iowa over the weekend. The Nebraska College of Technical Agriculture Livestock Judging Team participated Saturday in the inaugural livestock evaluation competition sponsored at the Heart City Bull Bash in Valentine, Nebraska. Then, the two vans carrying the team and coaches traveled that evening to Des Moines, Iowa for Sunday’s contest at the Iowa Beef Expo. They returned to the NCTA campus in Curtis shortly around midnight and were ready for the start of 8 a.m. classes on Monday. “We are used to some rigorous hours and conditioning for judging contests,” said Coach Doug Smith, who also heads the NCTA animal science and agriculture education program at the two-year college in Curtis. Kansan Emily Riley of Norton won the Bull Bash event with first overall in placings and fifth high individual overall (placings and oral reasons). She led the NCTA freshmen team members to fifth place as a team. The sophomore team was seventh high team. The Bull Bash is an annual event that brings ranchers and producers of purebred cattle breeding stock to Main Street in downtown Valentine. Portable pens filled with bulls, in particular, allow the public a venue to inspect offerings from the region’s ranches. Exhibitors promote their animals and merchandise in the outdoor event while retailers attract shoppers and rural ranch families to the social-type atmosphere. 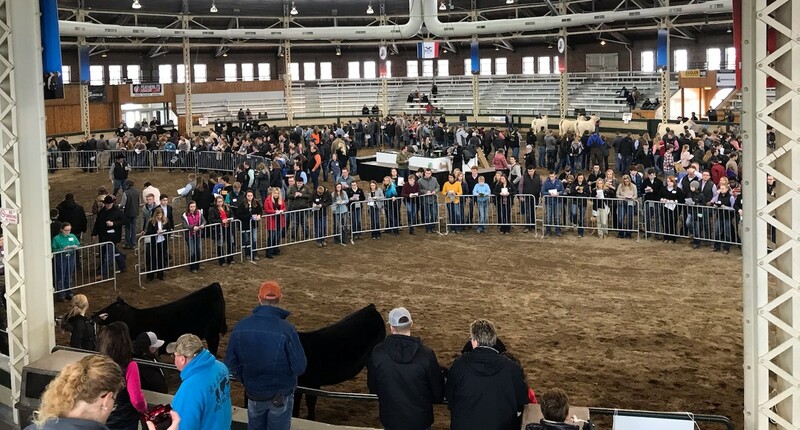 After awards were announced, the NCTA team loaded up their vans and headed to Des Moines for the collegiate contest which started Sunday at 9 a.m.
Aggie teams at the Iowa Beef Expo were among 17 full and three partial teams, said Smith. A full complement is a five-member team. The NCTA Aggie Red Team placed 12th with team members Emily Riley of Norton, Kansas, Garrett Lapp of Adamsville, Ohio, Seth Racicky of Mason City, Camden Wilke of Columbus, and Maisie Kennicutt of Wallace. The NCTA Aggie Black Team was 13th and consisted of Peyton McCord of Cairo, Rachel Miller of Bashor, Kansas, Grant Romshek of Shelby, Will Moeller of Grand Island and Colbey Luebbe of Seward. Coach Smith is assisted by two third-year students who competed the past two seasons on the Aggie team. They are Dean Fleer of Pierce and Nathan Lashley of Curtis. “As college students evaluate livestock, give oral reasons on their placings, and share comradery on these types of road trips, the stronger they become in leadership skills and developing lifelong friendships,” Smith said. The Aggies will compete next week at the Nebraska Cattleman’s Classic on Feb. 23 in Kearney.